Efficient Glucose Metabolism:The first part of the Optygen formula utilizes chromium for its ability to break down fuel. Chromium is an essential trace mineral that aids in glucose metabolism, regulation of insulin levels, and maintenance of healthy blood levels of cholesterol and other lipids. Chromium forms part of a compound in the body known as glucose tolerance factor (GTF), which is involved in regulating the actions of insulin in maintaining blood sugar levels and, possibly, in helping to control appetite. It is critical that any drink, bar or pre-race meal consumed prior to a race or exercise gets broken down efficiently in order to maximize your fuel delivery. Insulin spikes or lack of insulin response can cause the nutrients to either be rushed into your bloodstream too quickly or not quickly enough. Chromium regulates this nutrient breakdown so you have equal and sustained nutrient delivery to the working muscles. Efficient Oxygen Transfer:The second part of the Optygen formula uses adaptogenic herbs to improve oxygen effeciency. Originally, these two adaptogenic herbs were gathered by Tibetan Sherpas for use in their tea. The Sherpas used these herbs to give them energy to climb Everest, which they did without the use of supplemental oxygen. One of the adaptogenic applications of Rhodiola that has received considerable research attention recently is for aiding in adaptation to high altitude, thus, as a preventive treatment for hypoxia or mountain sickness. In June 2002, Dr Rulin Xiu was awarded a patent for her work showing Rhodiola's ability to oxygenate blood. Clinical studies on Cordyceps have proven its ability to increase endurance through more efficient enzyme activity, mobilization of free fatty acids and beta-oxidation. In a 1998 study, Dr. Edmond Burke observed that Cordyceps has the ability to improve lactate energy metabolism within the cell. All these mechanisms clearly show how these two adaptogenic herbs improve the efficiency of oxygen transfer in the cell leading to improvements in oxygen uptake and VO2max. ATP Production: The final step of the Optygen formulation puts all the necessary components together to assure efficient Adenosine Triphosphate (ATP) production. Clinical research has shown that endurance athletes diminish their ATP stores in exhaustive exercise, which can lead to a reduction in aerobic metabolism and endurance. Optygen 's proprietary ATPro™ matrix of five key nutrients is designed to assure ATP production. Since ATP is the final step in aerobic energy production, it is critical that the nutrients feeding the ATP cycle are readily available. Calcium pyruvate, sodium phosphate, potassium phosphate, adenosine and d-ribose all play critical roles in glycolysis and the citric acid cycle, leading to efficient ATP production. Endurance athlete's VO2max is directly proportional to their ability to efficiently produce ATP. 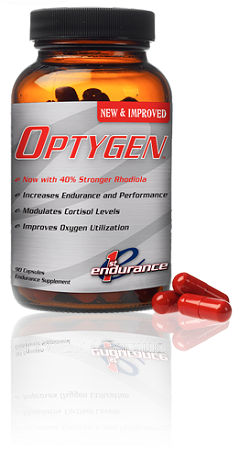 A synergistic formula:The combination of the three components of Optygen create a synergy with the sole purpose of improving race performance through increased VO2max, reduced lactic acid and increased endurance. Though Cordyceps and Rhodiola taken by themselves would offer enhanced performance, the combination including Chromium Chelate and the ATPro™ matrix complete the formulation. It is this synergistic combination of key ingredients that make Optygen such a powerful and complete endurance formula. This product increases lung capacity and makes climbing in the mountains, as well as the high-stress situations of the final 500m a lot more tolerable. I catch my competition huffing & puffing when my breathing is at a comfortable rate and volume. I can ride longer, and more efficient when I use this. Took this for a month and a half before the first race of the season. Noticeable improvement in lung strength and efficiency. Too bad my legs couldn't keep up. Time to hit the saddle.